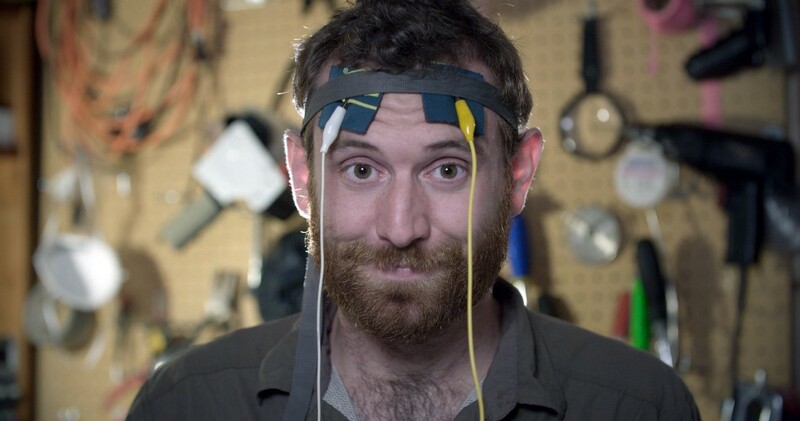 We live in an age in which people willingly lube up homemade electrodes, strap them to their heads, and then crank up some voltage to zap their brains. It’s called transcranial direct-current stimulation, or tDCS, and it is very much a thing — there’s some slick consumer products you can buy to get in on the action, doctors offering tDCS as a treatment, a whole world of DIY self-practitioners, and an active subreddit for electronic brain hackers to trade tips. We even made a mini-doc profiling a particularly energetic self-shocker in Atlanta named Andy Quitmeyer. The idea is that the small electric current coming from the electrode changes the activity of the neurons in the part of the brain that gets zapped — if the charge is positive, it excites the neurons, and if the charge is negative, it suppresses activity. Over the past 16 years, studies have found that tDCS might be able to help people do things like learn more effectively, immediately increase spatial awareness, and even treat depression. But a strong whiff of snake oil has sent stink lines over the whole tDCS endeavor from the get-go. Not because electrocuting your own brain is a bad idea (though Redditors do have a pinned post about avoiding the dreaded post-zap scalp burn), but because some suspect the practice doesn’t actually electrocute the brain enough. The 1–2 milliamp current that most tDCS procedures apply to the scalp, the argument goes, just isn’t strong enough to get through the skin and the skull and actually mess with some gray matter. And until now, nobody had figured out a way to actually track tDCS’s action in the brain to see what was going on. Yesterday, a team of researchers from the University of California at Los Angeles and the University of Southern California published a paper in Scientific Reports showing how, using some sophisticated software and a little-used component of the data produced by an MRI scan, they were able to watch tDCS in action in a living human brain for the first time. And despite the low amperage, it looks like the charge does actually wiggle its electromagnetic fingers down through the skull and into the brain. The technique that Wang and Mayank Jog, lead author on the paper and a graduate student at UCLA, helped come up with relies on basic physics — the fact that an electric current creates a magnetic field — plus a novel rejiggering of the output from a standard MRI scan. Compared to the massive magnetic fields generated inside the coil of an MRI machine, the tDCS current creates only one little blip among many in the living body, but the researchers were able to come up with an algorithm that could filter out the electromagnetic noise and isolate the arc of the direct current applied to the head. That doesn’t mean they figured out whether tDCS actually “works” in the sense of juicing up brainpower or zapping away depression. But now that researcher can actually see tDCS in action, it should be a lot easier to study its effects — you have to invent the telescope before you can study the stars. Specifically, Jog and Wang plan to combine their new imaging technique with fMRI methods that show how much blood is going to a given part of the brain at any moment, which researchers use as a proxy for heightened brain activity. Because the tDCS detection just uses a different interpretation of the same raw scan data, it shouldn’t prove too difficult to see if the jolt from the electrode corresponds to a spike in neural activity in the targeted chunk of the brain. Once that research gets underway, the next challenge will be figuring out how to dial in precise targets, adjust the electrical dosage, and actually measure the behavioral and neurological effects. Jog was drawn to studying tDCS not only because it presented an interesting imaging challenge, but because he sees it as a low-cost health-care technique that could be put to good use by anyone with a few simple components and a spare battery. If the prior results on accelerating stroke recovery, alleviating depression, and generally juicing the mind can be mapped and replicated, tDCS could become a standard tool in the medical arsenal — and not just in the well-funded facilities that can afford expensive tech like MRI machines. In the meantime, though, we now have proof that strapping electrodes to your head and turning up the current actually does shoot some juice into your brain. So please, zap wisely.